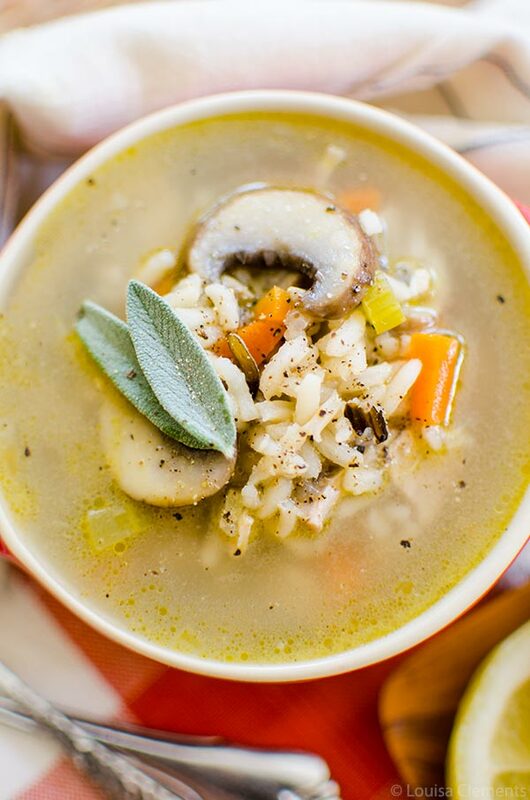 Take those Thanksgiving leftovers to the next level with this leftover turkey and wild rice soup with mushrooms, carrots and sage. In Canada we celebrate Thanksgiving in October, and like I mentioned over a month ago in my Thanksgiving salad recipe blog post, this year it felt like it just came way too fast. I wasn’t ready for Thanksgiving. Work had been pretty crazy for basically all of September and October and on top of that, I’d had three evening events the week leading up to Thanksgiving. All good things, but still things that were creating a bit of a mental block from really being in the moment and the mood for Thanksgiving. Once the long weekend hit, I felt like I just wanted to sleep and do nothing, but of course I still wanted to celebrate my favourite holiday. It ended up being a bit of a haze of a long weekend, nothing particularly stands out except just how exhausted I was. I think I went to bed one night before 9pm. I think I started to really love Thanksgiving after high school. In university it meant that all of my friends would be back in Toronto and we’d be able to catch up, and for a weekend, I wouldn’t feel so lonely. 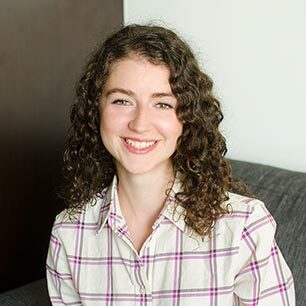 At the beginning of my university career, I did not like my school at all (I equated it so eloquently to developing recipes for vegan pancakes). I felt like I had made a serious mistake not following in the typical path of my friends and peers. Thanksgiving was a long weekend where things would go back to what I considered “normal” and I loved that. I loved that comfortable and cozy feeling of friendship and camaraderie that I had yet to find in university. I’ll never forget crying in my friend’s kitchen that Thanksgiving of freshman year. And then time did its thing. Eventually, I found my people in university, and now, almost everyone I love lives here in Toronto (with the exception of a few, all the more reason to go visit them, though). Friendships have changed and shifted, for sure, there are ebbs and flows in every relationship, but I still have the same core crew that I’ve had pretty much my whole life and they are speckled throughout this city that I love. So, maybe Thanksgiving is meaningful in a different way than it once was? I guess the feelings around holidays change as you grow up. This leftover turkey and wild rice soup is for the day after Thanksgiving. When you still have a ton of leftover turkey, some mushrooms (because you bought too many for the sourdough Thanksgiving stuffing you made) and herbs. This leftover soup uses a wild rice blend that I pick up at my local grocery store, but you can also use regular rice or brown rice here. The secret to a perfect turkey soup? Lemon. Turkey tends to have a richer flavour than chicken and I find brightening the soup up with a sprinkle of lemon juice does the trick — this is something I learned from my mom, who makes a fabulous leftover turkey and rice soup. Heat a large pot over medium heat, add oil, carrot, celery and onion. Cook for 7 minutes. Add mushrooms and cook for another 3 minutes then add rice and salt, stirring to coat. Add broth, dried sage and bay leaves. Bring to a boil, cover and reduce heat and simmer for 35 minutes. Stir in turkey and lemon juice before serving. 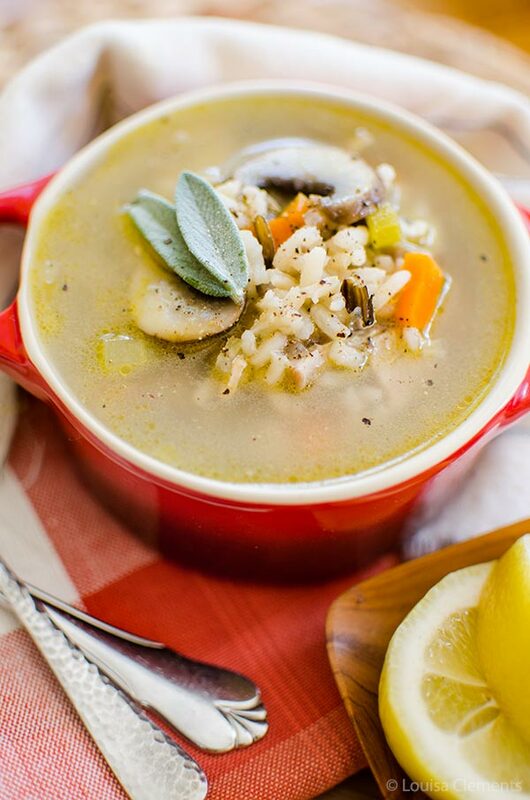 Let me know if you give this leftover turkey and wild rice soup a try in the comments below.